In 2018 Pavee Point’s Primary Health Care Project took part in a project with the Abbey Theatre to give voice to marginalised groups. We undertook to tell the story of our project through drama. This 27 minute film gives an insight into our experience as part of the 5×5 project at the Abbey. What’s the history of Irish Travellers? This is the third episode of season one of DCTV’s traditional Irish music series called “Coppers and Brass”. The series focuses on alternative viewpoints within the traditional Irish music community, looks at the contributions certain families have made and analyses how Irish Travellers have made a very significant contribution to the development of Irish traditional music. Presented by Tommy Fegan. January 2015. In the episode below DCTV looks at Irish Traveller culture featuring insightful interviews with Martin Collins, Co-Director of Pavee Point, Michael McDonagh and a performance from the Cobblestone Pub with Seán Gilrane & Davy Sheridan. In the episode below DCTV looks at the influence of the Doran Family, chat to Oliver O’Connell and enjoy a performance from the Cobblestone Pub with Oliver O’Connell and friends . In the episode below DCTV looks at the impact of Irish traveller Uileann piping on traditional Irish music featuring an insightful interview with Leo Rickard and a performance from the Cobblestone Pub with Gay McKeon. Seventeen Travellers, young and old, carve a multi-dimensional image for us of many aspects of Traveller life. From “crazy” childbirths to sorrowful funerals, from kindness in the camps to the tricks of dealing, this selection of interviews asserts a context and a past of a people who are so often seen as having no past and therefore no valid claim to a present, or to a future. People have always told stories and sung songs, and always will. The sung and spoken narratives in this collection are international, all of them travellers in their own way, as Johnny Cassidy and his family were. Their tales and songs represent a vibrant oral tradition stretching back hundreds, and possibly thousands, of years. Near relations to this type of material can be found in the earliest literary collections of antiquity, throughoutthe classical period, right up into the Middle Ages and beyond. The stories and motifs found here span a vast distance in space as well as time, reaching across continents and oceans with apparent ease, from Ireland to India to the New World. As times change , so too do the stories, assuming new attire and a different guise. Click the CD cover to view the booklet PDF. A rare recording of Irish Traveller music The Raineys is available to purchase from Pavee Point. The Rainey family were well known Galway musicians whose music was renowned throughout the country. The CD is a recording by Professor Tony Knowland of rare tracks performed by the Raineys in Freeneys Pub in Letterfrack Connemara in 1956. This collection is the only known recording of the Raineys and it is the first time their music has been recorded on a C.D. Music and song have always been important to Traveller life and culture. This collection, which includes some of the best examples of recorded music and song by Travellers, is being released as part of Pavee Point’s twentieth anniversary celebrations. Originally released in 1983, these are songs chosen by expert Tom Munnells when he was asked to make a selection of Travellers’ songs. These tracks were then published by the European Ethnic and Oral Traditions body. 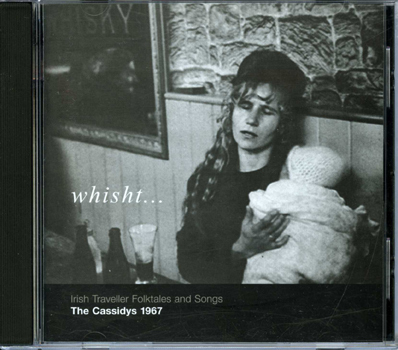 This CD features rare recordings of Traveller musicians such as the renowned John Reilly. This video documentary explores the richness of Traveller culture both past and present. It examines such areas as Traveller language, nomadism, the oral and music traditions, the Traveller economy and extended family networks. NOTE: This publication is discontinued in its original VHS format. Editions on DVD are available; this may be useful for small groups, but please be aware that the mastering quality of the publication is not of a uniformly excellent standard. 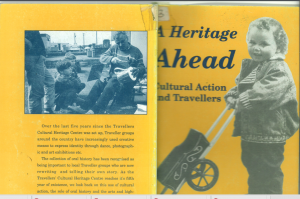 A series of lectures dating from 1994 and part of the Travellers Cultural Heritage Centre project. 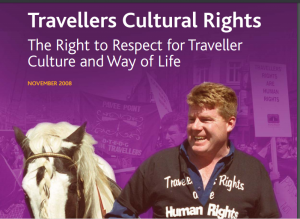 These include Travellers and History by John O’Connell, Traveller and the Oral Tradition by Bairbre O’Floinn of the Dept of Folklore, NUI Dublin, Travellers Language by Alice Binchy and Community Museums by Hugues de Varine.